BSA Troop 219 - Wayne, Pa. Since 1937, we have been helping Scouts build character based on both the BSA values and those of our sponsoring organization, St. Katharine of Siena Parish. Our activities include camping, hiking, rock climbing, community service, and more. We have a year round schedule that incorperates learning, skill building, and fun for all members. 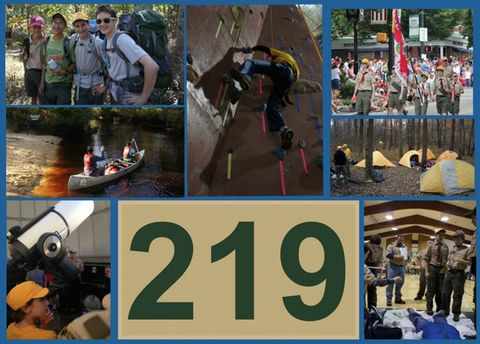 For more info, visit the "About Troop 219" link on the left! Our annual banquet and spring Court of Honor is this Sunday, April 7th, from 4-7pm in Fellowship Hall at Wayne United Methodist Church, 201 S. Wayne Avenue, Wayne, PA. This is the church across Wayne Avenue from the Radnor Middle School. Park in the lot behind the church, enter through the rear double doors, take a left and go down the stairs to Fellowship Hall. There is no charge and everyone in the family is welcome. The troop supplies the main courses. Families with last names from A to M are requested to bring a dessert to share; families with last names from N to Z are requested to bring an appetizer to share. 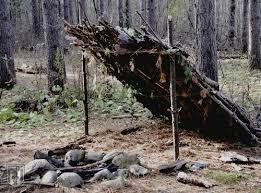 Our Wilderness Survival Campout has been rescheduled to this weekend. Learn the skills to survive in the wild. This is also an opportunity for those with partial completions of the Wilderness Survival merit badge from summer camp to complete the badge by sleeping one night in a shelter they construct. Please indicate whether you are coming or not by clicking on the event to the right. 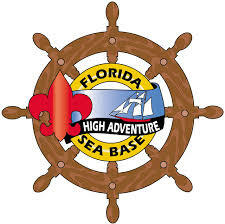 Sea Base requires all participants to complete the BSA swim test prior to arrival at Sea Base. Everyone must be classified a swimmer which means swimming in a "strong manner" for 100 yards - 75 yards front stroke (crawl, breast, or side) followed by 25 yards Elementary Backstroke - and then floating on your back. Swim tests will be held this Sunday between 5 & 6pm at the Valley Forge Military Academy indoor pool in Price Hall. A friendly reminder that registration for the 2019 Cradle of Liberty Merit Badge College opens this Friday at noon! Spots fill up extremely fast, especially for Eagle-required badges, so be sure to register early. To go to the council registration page, please click here. Time to get your t-shirt size to Mr. Bryan (dbryan@troop219wayne.com) so we can place the order for the customized shirts for our Sea Base trek in August. Shirts come in adult XS, S, M, L, & XL. The sixth annual Cradle of Liberty Merit Badge College will take place on May 4 and 11, 2019 at Perkiomen Valley Middle School East in Collegeville, Pa. For additional information such as registration, pre-requisites, and badges offered please visit Merit Badge College. For Personal Management, you must start requirement 2 by February 1, 2019. Other badges have similar requirements so please plan ahead before selecting classes and registering on March 1, 2019 at noon.